StreamUp Review 2019: Is StreamUp a Good Hosting? London-based StreamUp prides itself on providing reliable hosting plans at reasonable prices. StreamUp was established in 2014. It’s based in Covent Garden, London, and offers premium cloud hosting plans using servers with SSD storage. This provider offers cPanel and Plesk-powered web hosting, WordPress hosting, reseller hosting, and CMS/e-commerce hosting plans (for Joomla, PrestaShop, Magento, Drupal, and OpenCart). StreamUp also offers web radio streaming and web radio reseller services, hence its name. StreamUp’s website can be switched between the English and Greek languages, and its client support area can be changed into four additional languages: French, German, Italian, and Spanish. StreamUp also offers AWStats and Webalizer so you can see your website statistics. You get SpamAssassin and MailChannels for email spam filtering and protection against malicious email threats, and the BitNinja robust server security software guards against DDoS, brute force, and other automated attacks. This company’s cloud servers use enterprise SSD storage arrays to ensure speedy performance with zero downtime. 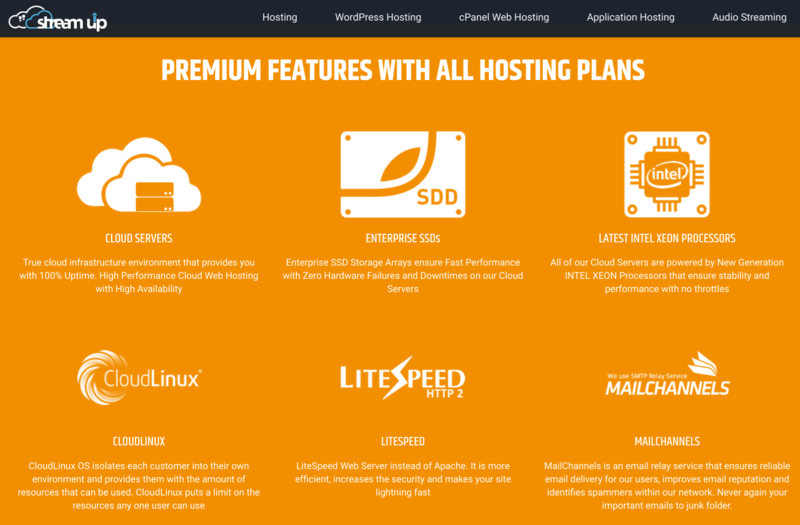 In addition to the shared hosting plans, StreamUp offers four managed WordPress hosting plans with Plesk, four reseller cloud hosting plans, and four hosting plans for each of Joomla, PrestaShop, Magento, Drupal, and OpenCart. StreamUp’s hosting plans are incredibly affordable, even with the 20% VAT added, and you can pay for them in euros or British pounds via PayPal, Piraeus Bank, or paysafecard. Available billing cycles are monthly, quarterly, semi-annual, annual, and biennial, and you can get a 15% discount with all one-year subscriptions. If you’re unsure about signing up for a full year, you can take comfort from the 30-day refund (on annual plans) that should get you out if anything goes wrong. Understandably, there is a shorter 7-day refund for monthly plans. You can also try before you buy thanks to the free cloud web hosting for 30 days. You can reach out to StreamUp’s customer service via email or a ticket system. There’s also live chat, but it was offline when I tried it. I submitted a message instead, which was answered promptly. StreamUp’s self-help knowledge base is focused on its streaming services and doesn’t offer any information for hosting customers. For fast, secure, reliable, good-value hosting, StreamUp’s plans could be just what you’re looking for. Get your website up with StreamUp’s affordable cloud hosting plans. Wondering how StreamUp stacks up against other Web Hosting companies? Enter any other Web Hosting company and we will give you a side-by-side comparison.